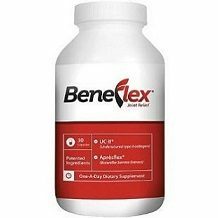 The following is our review of Beneflex Joint Relief. It is a dietary supplement that provides 4 main ingredients for joint relief. It claims to be the latest in cutting edge research. It is a highly concentrated capsule that is supposed to be a premium joint formula. Continue reading for our full review. Other ingredients include gelatin, cellulose, and magnesium stearate. The active ingredients in this product were chosen since they are natural anti-inflammatory compounds that will hopefully increase the antioxidant capacity of the body. It is recommended to take 1 capsule a day with water. It doesn’t clarify at what time of day it should be taken. This product is only intended for adults. You should consult a healthcare professional before using this product if you are pregnant, nursing, have a known medical condition, or are taking prescription medication. Beneflex Joint Relief can’t be purchased directly from the manufacturer. We found it on vitaminshoppe for $47.99 for a 1-month supply of 30 capsules. This is obviously a very expensive product. This product is backed by a 30-day money back guarantee. If you are returning an auto-ship delivery, you have 30 days to return it if you are unsatisfied. You can return it even if you’ve used the full supply of the supplement. You will be refunded the purchase price plus shipping and processing. You must pay for return shipping though. If you would like to return an item that was a standard delivery, it needs to be unopened and in original packaging. For both types of returns, you will need to call customer service and get a return authorization number. You will then need to put that number on the outside of the return package. It will generally take 3-5 business days to process your refund from when the department receives your return. There are a couple of positive things about Beneflex Joint Relief. This product is backed by a great guarantee if you are enrolled in their auto-ship program. There were also a bunch of positive customer reviews. One customer said they have been using this product for 2 years but they knew after 3 days that it was working. Another customer said how they had tried everything but nothing worked like this product. There are a couple of negatives as well. Yes, this product has a great guarantee, but it only allows customers who enrolled in the auto-ship program to try the product and still be able to qualify for a refund. We feel that a customer who just wants to buy 1 bottle with standard delivery, should have that same option. This product is also very expensive, since it only gives a 1-month supply for $47.99. We feel you can find a more affordable product elsewhere.